Yes, it's called "Seattle Restaurant Week", but lucky for us it's two weeks long! Seattle Restaurant Week gives everyone a chance to try out some new restaurants for a great price. You get three courses for only $30! 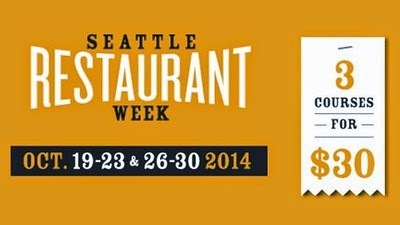 Check out the Seattle Restaurant Week website for a listing of over 160 restaurants who are participating. Now make your game plan, and get out there and EAT!! Cheers! These guys really worked within our budget to create an unforgettable wedding experience. My wife and I were beyond pleased with the service at San Francisco restaurants, especially day of.